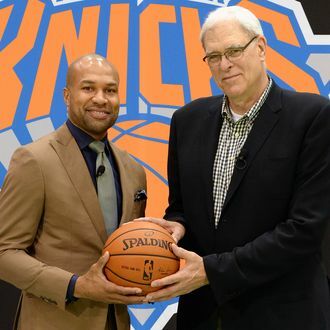 The New York Knicks have given Derek Fisher the boot midway through his second season as head coach. The Knicks posted the announcement Monday morning and named Kurt Rambis interim head coach. Fisher was named head coach in June 2014 by Phil Jackson, who had taken over as the struggling team’s president. This was Fisher’s first head-coaching position, and in his freshman season the Knicks finished off the year 17–65, one of the worst records in the entire NBA. This year the team also has a losing record and is suffering through a five-game losing streak. They’ve also lost nine of their last ten games. Rambis, who is a Knicks associate head coach, had spent two seasons as head coach of the Minnesota Timberwolves until 2011. According to ESPN, Brian Shaw and Luke Walton are being discussed as top candidates to permanently take over the job. (Both Shaw and Walton played for Phil Jackson.) Shaw was formerly the head coach of the Denver Nuggets; Walton is an assistant coach with the Golden State Warriors and led the team to a 15-game winning streak as interim head coach to start the season.